Vivid colors and stunning accents are not seen in every hallway or living room in the country, but do you really want to be just one of the crowd? Why not let your exotic side shine through with Moroccan home decor? Include exotic Moroccan furniture and accessories to create a look that is both provocative and surprising. When you use Moroccan home decor you will never be anything less than excited about the way your home looks. Moroccan furniture and home decor can help you make your room original and unique, a place where gas and friends will want to hang out and be comfortable. You will have the feeling that you have entered another country and culture when you use authentic Moroccan furniture, however this quality and beauty does not come cheap. When you’re looking at these pieces remember that the hand carving, quality wood, and elaborate decorations remember that the price being asked is small considering these pieces will maintain their value and last for many years. Moroccan furniture is intended to be passed down through the generations while keeping a beautiful appearance, and these pieces can include varying patterns such as geometric and floral. Moroccan home decor and accessories commonly feature henna. Henna Moroccan lamps offer brilliant colors including yellow, purple, amber, and others. These Moroccan home lighting fixtures include exotic patterns and brilliant colors that are inspiring as well as breathtaking. Moroccan lanterns do not come in any typical style, instead each piece is a unique and original piece of art that is to be treasured. Feel a thing that these lighting fixtures having common is that they are unexpected and include vivid details that are eye-catching. 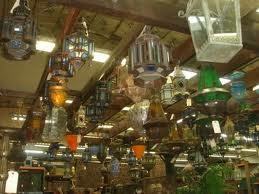 Start shaped Moroccan lanterns will emit colored light in many directions from the lamp points. You can also find Moroccan lanterns that include rustic metals and stained glass to create an atmosphere that is romantic and mysterious. Instead of using plain tiles and colored lights. why not reverse this and use colored tiles as the focal point for regular light? Moroccan tiles can be used to create interesting mosaics that include rich colors and intricate designs. You can create tiles designs in a variety of colors including yellow, orange, blue, and green. This strategy can be excellent for any kitchen or bathroom if you want a colorful look and a lively feel which makes spending time in this room pleasant. Moroccan home decor should include rugs in bright colors and creative designs, as well as colorful and luxurious fabrics and plenty of pillows and cushions. Combined some throws with some embroidered pillows to create a sofa that is both visually appealing and comfortable. For an authentic feel for your Moroccan home decor a smoking hookah can really add to the atmosphere, and be a real conversation starter. Inform everyone that you know that your home decorating scheme includes Moroccan decor, and then start looking. Choose a hookah which has a finish that is bronze or stainless steel, and that includes bowls and tubes which include vivid colors and designs. A glass tea set can be used for the finishing touches with your Moroccan home Decor. This that can be displayed in a china cabinet or in a covered with a glass door, and should include gold designs that are elaborate against as vividly colored background. This tea set is the perfect way to make some Moroccan mint tea, and this will help to create an exotic atmosphere that is both comfortable and luxurious. *Seomul Evans is a Marketing Services consultant for Moroccan Furniture and Moroccan Henna Lamps importer.